The Canary joined a crowd of over 2000 people at a post-budget rally with Jeremy Corbyn. 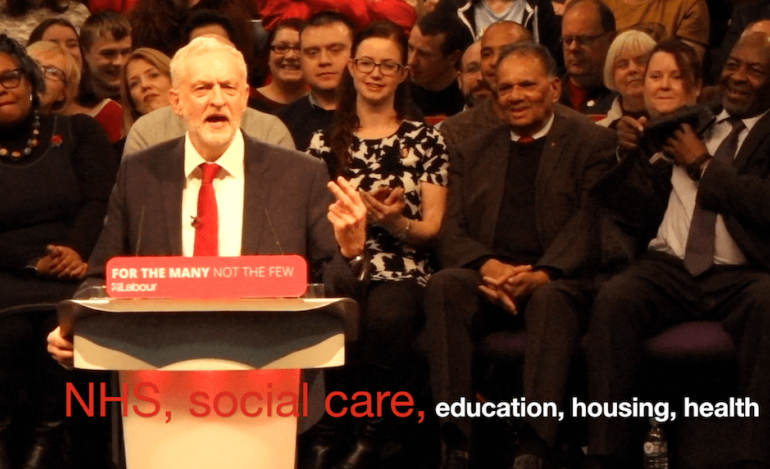 Rapturous applause, whistles and chants of “Oh Jeremy Corbyn” filled the Bethel Convention Centre in West Bromwich as the Labour leader stepped onto the stage. The place was packed to the rafters with teachers, activists, blue collar workers, academics, campaigners and councillors. A visibly elated audience listened as Corbyn and Shadow Chancellor John McDonnell slammed Chancellor Philip Hammond’s budget proposals. They declared new proposals for education, social care, the NHS and housing. Absolutely inspiring. It’s what we need. The country needs hope. I thought it was absolutely outstanding. An inspiration and a way to go on so we can fight those elections in May and win. I thought it was really inspiring that he was actually talking about education. It’s one of the fundamental principles of society which will actually hold us up. Because without education, we can’t progress as people, we can’t get into the jobs we need, and we can’t progress as a society, together. The emphasis was on reclaiming public ownership of water, rail, mail, energy, the NHS, and education. Re-nationalisation of the water industries and the essential resources that we need – I think that’s the right thing to do. We need a massive housing plan, and only Labour can deliver that. We Own It founder Cat Hobbs spoke out against privatisation. Her speech was followed by Director of the Centre for Labour and Social Studies Faiza Shaheen, who lashed out at the disconnect of the elite bubble. Brilliant speech. Telling us we’re going to fight the Tories. And we’re going to take the fight to them – so we’re ready for it. The reaction of the crowd seemed to suggest that Hammond’s budget was good for one thing: it served to confirm a necessary change of government. And if cabinet splits lead to a “vote of no confidence… triggering early elections” – and Labour wins the majority of local elections 0n 3 May 2018 – Theresa May could well be moving out of Number 10. – Read more about the budget from The Canary.